« Is the daily newspaper thin? Yes. Does it contain significantly less space for news, photos and other editorial content? No. By unpredictable, she indicated readers should not expect the newspaper’s editorial positions to be consistently and decidedly liberal, as they have been in recent years. “I think it will be more difficult to characterize the editorial board’s views in the future,” she said. Nelson’s appearance came at a meeting on the Plaza of the 40 Years Ago Column Club…When it organized many years ago, the club was open only to people who had been mentioned in a “Forty Years Ago” column. Now it is open to almost anyone who is interested. About 40 people, including several former KC Star employees, were on hand Monday. Last week, the paper announced the creation of a reconstituted editorial page, with an editorial board that will consist of eight people — seven who are in place now and one to be hired in the coming weeks. Leading the editorial board, of course, is the publisher, Tony Berg, who hired Nelson last August, after laying off longtime editorial writer Yael Abouhalkah. Another editorial page stalwart, Lewis Diuguid, also departed, leaving Berg as the lone editorial board member for more than two months. During that time, the editorial page has consisted largely of syndicated columns, letters to the editor and political cartoons. The drought of staff-written editorials will end this coming Sunday, Nelson said, drawing smiles and nods of appreciation from several audience members. 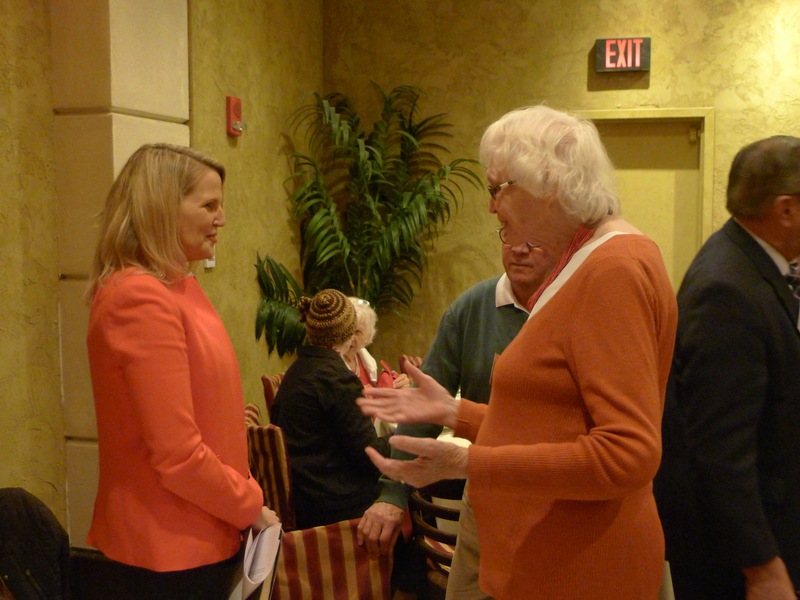 Colleen McCain Nelson, left, chatted with Mary Abbott yesterday after Nelson spoke to the 40 Years Ago Column Club at a Plaza luncheon. Among other things, Nelson talked about growing up in Salina, attending the University of Kansas and working as a political reporter for the Wichita Eagle before heading off to bigger posts, including the Dallas Morning News’ editorial page, where she and two colleagues won a Pulitzer Prize in 2010. Her husband, Eric Nelson, is also a KU graduate, and he, too, is working for The Star, leading the paper’s digital operation. Most recently, Colleen (pronounced with a long “o”) Nelson spent five years writing for the Wall Street Journal, topping off her time there by covering the recently concluded presidential campaign. Hear, hear. Tony Berg has been publisher about a year now. It’s taken a long time for him to get a credible editorial team in place, but it’s taking shape. Let’s hope we soon have a substantial, forceful and well-written editorial page that agitates for Missouri, Kansas and the Kansas City area in particular, to become better places to live, work and do business. Thanks, Jim. I guess I could have gone to that lunch (such elite privilege!) since I worked on the page under Jim Scott for six mostly wonderful years. I’m not quite sure why “several people in attendance Monday said they came away impressed by Nelson.” Looking at the sampling of her comments, I see a lot of platitudes with few specifics. In any event, what she said yesterday doesn’t really matter. I’ll reserve my judgement on Nelson until after I have seen some actual editorials. Very true, Mark, but, as in anything else, the person trying to make “the sale” has a good head start when he or she impresses the prospective buyer with knowledge, qualifications and sincerity. We saw that yesterday. It was a different story several years ago when incoming publisher Mi-Ai Parrish spoke to the same group and spoke listlessly from a script while leaning against a wall. We wanted to think she was going to be good, but that first impression turned out to be correct; she was a flop. It’s clear that Nelson has bought into rightwing talking points that the Star is too liberal. It has been relentlessly pro-establishment for years, which is Democrat in KC MO and KCK, and moderate Republican in Joco and Topeka. Why promise that the editorial slant will be less liberal in advance of knowing what the facts of a situation are? That suggests a quota system of opinions without regard to the specifics–we had a “liberal” opinion Monday, so we better have a “conservative” opinion Tuesday. Steve Vockrodt announced on Twitter today that he has added JOCO politics to his portfolio. I then suggested to him that The Star had forgotten WYCO and he replied that he is working on two major WYCO stories. So good news on those fronts. As for the editorial page, and let me apologize in advance for being somewhat harsh, but I don’t know how narrow-minded you have to be that you can’t tolerate seeing another perspective in print on the very page that should offer a variety of interesting perspectives if it is to have any meaning at all. While some of you may have enjoyed the editorial pages these past few years, many of us found them tedious and predictable. When people would ask me how to vote I would tell them to find The Star’s endorsements and vote against them. It’s obviously taken me several days to think about adding a comment. Being close to The Star, and an eager reader before that, I have a lot of memories; I feel privileged to have lived my life in the company of journalists. I hope the new board will take a long look back to the past and see that it has taken almost fourteen decades of work by dedicated journalists to create the platform upon which they can take The Star into the future.